Sion Sono takes another trip towards the preposterous, this time managing to mix tokusatsu, kaiju, and family film elements while mocking a vast plethora of notions, including the Olympic Games, history, the music industry, bullying, pop culture, and even Santa Claus. Ryoichi is the definition of loser. When he was young, he dreamt of becoming a punk rock star but instead ended up being a timid white-collar employee of a musical parts company. Furthermore, everybody seems to constantly mock him and that includes not just his co-workers and boss, but actually everybody. From the passengers of the train he takes to work every day, who seem to stare at him perpetually, to talk-show producers on TV, in a distinct surrealistic notion, typical of Sono’s style. Ryoichi has feelings for a co-worker, Yuko Terajima, but he too ashamed to make a move, to the point where he does not even realize she shares the sentiment. Eventually he adopts a turtle, names it Pikadon, and proceeds on confessing all of his dreams to it, without realizing that the creature is listening to him and is actually eager to make his dream come true. However, when his co-workers find out that he adores the turtle and actually carries it with him all the time, they mock him even more and Ryoichi ends up flushing Pikadon down the toilette. Instead of dying though, Pikadon ends up in the hands of a mysterious old man, who lives in a secluded area of the sewers he calls “Lost and Found Heaven”, along with living toys and stray animals. The old man proves to be a magician of sorts, with potions that actually make living, talking objects out of stuffed animals, dolls and toy robots. When he decides to give Pikadon the elixir of speech, he mixes up the potions (probably because he is almost constantly drunk) and instead gives it the wish-granting one. Pikadon then proceeds on fulfilling his former master’s wishes and Ryoichi soon transforms to a full-scale rock star. However, the turtle seems to grow in size as it continues to fulfill his master’s dreams, while Ryoichi becomes more and more, a spoiled star. Sono, in a rather unusual tactic for him, stayed away from anything violent and sexually perverse in this film, which actually aims at kids and families. This however, does not mean that this is a Disney movie, since Sono’s inclination towards the absurdly surrealistic and his distinct, “blasphemous” sense of humor are once more present, although both are a bit toned down. After a point, the film takes a turn towards the dramatic, as Ryouchi becomes more and more despicable and Pikadon bigger and bigger, while the various toys realize their actual fate. Particularly the last scene in the “Lost and Found Heaven”,is one that could definitely bring tears to the eyes of every spectator. However, during this dramatic sequence, occurs the sole tedious point of the film, as Sono seem to lag without a cause, although for just ten or fifteen minutes. Hiroki Hasegawa as Ryoichi acts in the usual, hyperbolic fashion that seems to have taken over all of Japan’s actors, with excessive facial expressions and body movements, which fits perfectly, however, the general aesthetics of the film. Toshiyuki Nishida’s performance as the mysterious old man is more moderated and serious, with him emitting a clear sense of dignity in all the times he appears on screen. Kumiko Aso has a steadily timid role as Yuko, that does not give her many chances to show her considerable talent, altough she functions quite well in the film. Lastly, some of Sono’s favorite actors appear on small parts, including Kiyohiko Shibukawa, Motoki Fukami, Erina Mano and the voluptuously gorgeous Miyuki Matsuda (She is not a part of that group but I had to mention her). In an evident homage to the tokusatsu films (movies that featured extensive use of special effects) of the 60’s, Sono chose to use traditional special effects techniques rather than CGI, that resulted in a number of manufactured models that move. All of them look cute, however, including the robot that gets drunk at one point and the perpetually grumpy black stuffed cat, but most of all Pikadon, with its huge goggle eyes and shrill voice. Kiyotaka Taguchi’s work on this particular department is one of the film’s biggest assets. 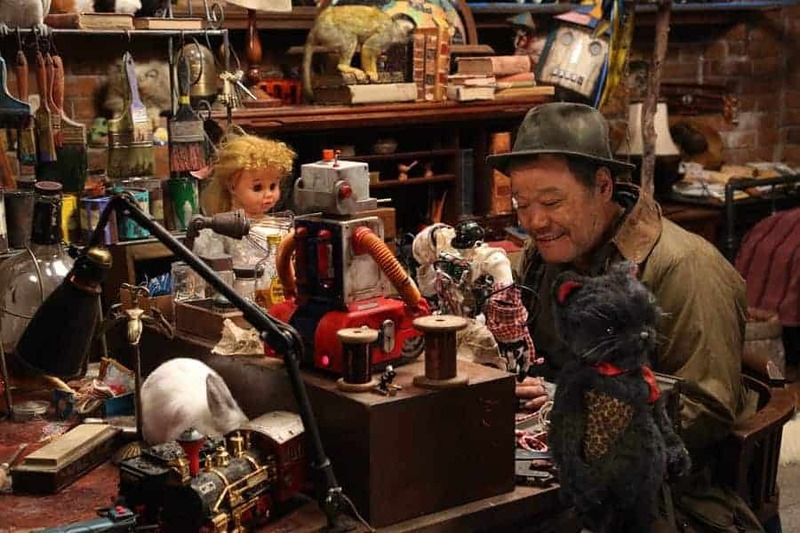 The cinematography and set design are great, in the usual, voluptuous style of the majority of Sono’s films, which includes motley colors and rooms filled with various objects. This tactic is exemplified in the magnificent sewer room, which seems like something out of a Dickens novel, particularly during Christmas. If there was one filmmaker that could take the word unpredictable home, it would have to be Sion Sono. “Love and Peace” is a prominent example of the fact.